JOHANNESBURG, Mar. 5, 2014 – Boeing [NYSE:BA] is launching an initiative with South African Airways (SAA) and the Roundtable on Sustainable Biomaterials (RSB) to expand opportunities for “smallhold” farmers in Southern Africa to grow crops that produce sustainable fuels. The program builds on a global effort by Boeing, RSB and other partners to help farmers with small plots of land gain access to markets for sustainable biofuels and biomaterials. 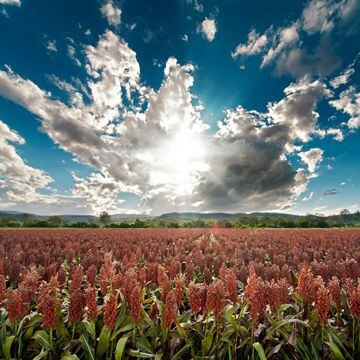 Shown here is sorghum, a plant that can be used to produce biofuel. The program builds on a global effort by Boeing, RSB and other partners to help farmers with small plots of land gain access to markets for sustainable biofuels and biomaterials. In the coming months, Boeing and RSB will work with Southern African stakeholders to create pilot programs to build knowledge and skills among groups of farmers who want to certify their crops as sustainable. Over the long term, as Southern Africa gains capacity in this area, more farmers will be positioned to tap into demand for biofuel feedstocks certified to provide socio-economic value to communities without adverse impact to food supplies, fresh water or land use. "We will work with partners from across the region to identify how we can join together to help small farmers improve their production and income," says Rolf Hogan, Executive Secretary, Roundtable on Sustainable Biomaterials. "Certifying small farmers is the surest way to ensure sustainable biofuels that not only reduce carbon emissions but also improve the livelihoods of rural communities."